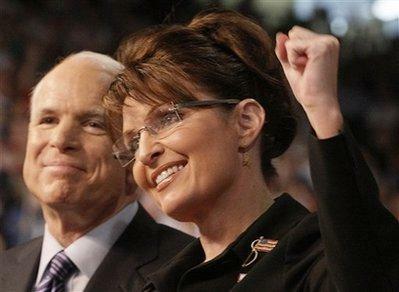 If Barack Obama had picked Hillary Clinton would John McCain have picked Sarah Palin? You know it will be debated. Clearly, either way Palin is the right person in the right place at the right time. I don’t know the answer… but I can say I’m just one American very excited about McCain’s selection for Vice President. It’s hard to believe today is the day after Barack Obama’s night… Where is he today? No one is talking about him? The only thing I’ve heard thus far was a statement from his campaign about Palin having been a mayor of a small town. As if to put her down… Hmmm? Talk about elitism at it’s best. His campaign wants to relate to America? How will he ever be able to relate with Small-town, USA – like that? But it’s not really about the people anyway… is it? What catapulted Obama to the forefront of American Politics? Obviously, at some point in time he was in the right place at the right time. Have you ever had an experience where you were at the right place at the right time? Life is full of stories much like this one that is making history today. But more than the experience itself – what did you do with the opportunity? As I have thought about what has transpired today, I can’t help but reflect on this thought. Our lives are all made up of moments in time… moments that can be described as being at the right place at the right time. So, what did you do with what you were given? 21“His master replied, ‘Well done, good and faithful servant! You have been faithful with a few things; I will put you in charge of many things. (NIV). I don’t know that much about Palin myself. While laying on the sofa re-cooping from yesterdays surgery, I have read as much as I could today and watched the news. My interpretation of her life may be too simplistic. I can’t help but be challenged by what I have read. We all have a mission in life… a mission to make a difference in the lives of others. Are you making the most of your opportunity? Are you making a difference in the world in which you live? Are you taking the necessary risks with the talents given? Obviously, Sarah Palin has made the most of every opportunity in her life. One report I heard today stated Palin has been in public service for 16 years. (The Fox Report with Shepherd Smith). According to Wikipedia, in 1996 Palin was elected Mayor of Wasilla, Alaska for the first of her two – three year terms. In 2006, she was elected to Governor of Alaska and is now running for Vice President of the United States of America. In a short period of time she has put her talents to work. And from what it sounds like she has done so with great conviction and risk. She is living “The American Dream” as it unfolds before our eyes. You have been very busy today!